I just had to share this picture I mean it is cute on so many levels I am not sure where to begin. I mean first of all Oscar is sound asleep on his little side with paws crossed and he is perfectly positioned in a beam of sun! I don’t know what it is but animals + sunbeam action= makes me melt!!! This is one of our babies and if you can’t tell I love them all more than words! Previous Post Bag Your It…. Cute.What kind of dog is that? His legs look so short….how adorable!! 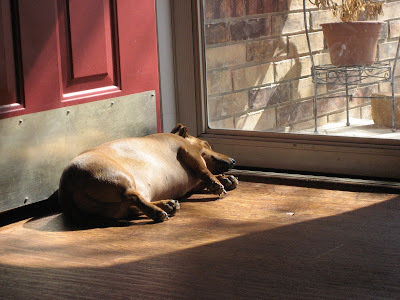 !Don’t you wish humans could get away with soaking up the sun like that…just plopped down on the floor beside the door. Lol.